I’ve heard about diets consisting of 600 calories daily, so this doesn’t seem like real fasting to me! There’s a guy who became famous online for fasting for 50 days I think. During certain days, he wasn’t even drinking water. Solid food was out of the question. I was subjected to a 600 calorie diet many years ago. I remember losing 20 pounds per month with it. However, I can’t eat apples since. 600 is definitely something though compared to nothing. My brother is on an intermittent fasting diet. He can eat between 2pm and 10pm around 2000 calories and during the rest of the time he doesn’t eat anything. This way, he will achieve a weight loss of 20 pounds in a few months. At least that’s how an app that he uses calculated his progress. Did your brother lose weight? Though the positive effect of this diet is that I felt lighter than usual. The usual feeling I have is that I’m half way bloated all the time. My bowel movements also seemed to have gotten “regularize” while on the second day of fasting. I have recorded a 3 weight loss when I fasted for 2 days drinking only water. I don’t know how do they fast! But as I’m a Muslim, we fast about 13 hours a day for one month (Ramadan). during those hours, we have to not eat or drink anything or smoke. I think it’s so useful for my health. I wish you try it. You will feel the difference! This is what I see with the fasting Diet. 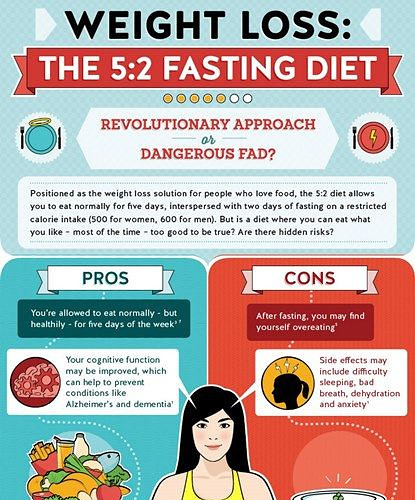 Diet can have a controlled feeding but not fasting one. The side effects can be more depleting than the diet where in you chose the food you eat. I agree with the over eating and can lead to more weight issues instead of losing it. Plus this also affect your mental health because of the hours that you fast. Although I respect some religions practicing this like our Muslim brothers and sisters. But the purpose of their fasting is their devotion to their God and they don’t aim it for Diet purpose so this is different. Maybe to have this mind set will help you to have good health. Plus our Muslim brothers and sisters has been practicing this for centuries so you need years to adapt this mentality and again they are doing this for their devotion. Intermittent fasting have specific approach. It’s good for me. I’t a good way to push your body to the limit but stay on the control. Most fasting cons happened when we lose control and began to crave high calorie food to break our fast. This is what our body command: I need a calorie now. Intermittent fasting doesn’t deny our calorie need, it just stretch our ability to resist hunger, while we still have mind control to healthier food we consume.